Apparently, the motor consumed most of the submarine’s air supply in just two minutes. The crew might have felt light headed and short of breath during the first minute, and would have begun losing consciousness in the second. The negative air pressure also made it impossible to open the hatches. A 2013 article by Reuters repeats this theory as well as mentioning the possibility that was exhaust was improperly vented back into the hull to fatal effect. A month later, an inquiry by his commission resulted in the dismissal of both the commander and commissar of the North Sea Fleet, and the demotion or dismissal of six or eight more officers for “improper command and control.” Jiang and President Hu Jintao later reportedly visited the recovered submarine and met with the families of the deceased. The Chinese government is not disposed to transparency regarding its military accidents. For example, it does not release the results of its investigations into jet fighter crashes and it never publicly acknowledged earlier submarine accidents. At the time, some commentators expressed surprise that Beijing acknowledged the incident at all, and speculated it was obliquely related to contemporaneous criticism of Beijing’s attempts to downplay the SARS epidemic. The Type 035 Ming-class submarine was an outdated second-generation design evolved from the lineage of the Soviet Romeo-class, in turn a Soviet development of the German Type XXI “Electric U-Boat” from World War II. The first two Type 035s were built in 1975 but remained easy to detect compared to contemporary American or Russian designs. Though China operated numerous diesel submarines, due to concerns over seaworthiness, they rarely ventured far beyond coastal waters in that era. Nonetheless, Chinese shipyards continued to build updated Ming-class boats well into the 1990s. Submarine 361 was one of the later Type 035G Ming III models, which introduced the capability to engage opposing submerged submarines with guided torpedoes. Entering service in 1995, she and three sister ships numbered 359 through 362 formed the North Sea Fleet’s 12th Submarine Brigade based in Liaoning province. You can see them together in this photo. 361 had been deployed on a naval exercise in the Bohai Sea, the Yellow Sea gulf east of Beijing and Tianjing. Unusually, a senior naval officer, Commodore Cheng Fuming was aboard. In its last ship’s log on April 16, the submarine was practicing silent running while off the Changshang island, heading back to a base in Weihai, Shandong Province. Because it was maintaining radio silence, the PLAN didn’t realize anything was amiss until ten days later. The method by which 361 was recovered after its presence was reported remains unclear. Several accounts imply the ship was submerged, but the fact that it was promptly towed back to port implies that it had surfaced. The lack of clear official explanation has led to various theories over the years. 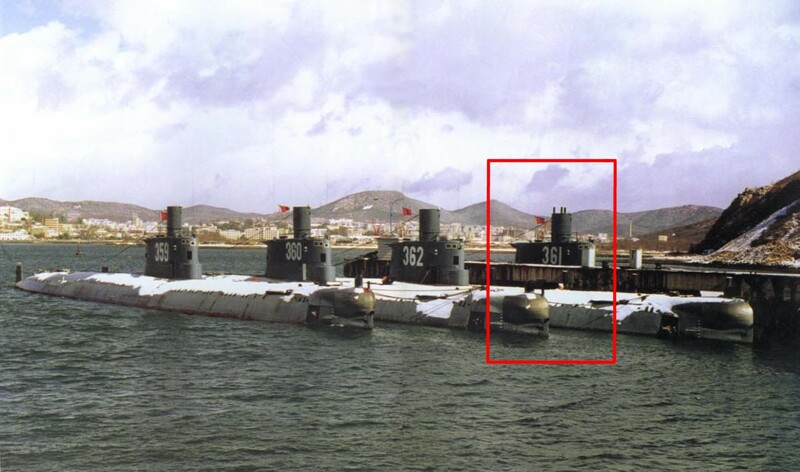 The typical complement of a Type 035 submarine is fifty-five to fifty-seven personnel, but 361 had seventy on board. Officially these were trainers, but conditions would have been quite cramped. The presence of the additional personnel and the high-ranking Commodore Cheng leads to the general conclusion that 361 was not on a routine mission. Indeed, some commentators speculated that the additional crew were observing tests of an experimental Air Independent Propulsion (AIP) system which would have offered greater stealth and underwater endurance. As it happens, another Type 035G submarine, 308, was used to test an AIP drive, and Stirling AIP drives would soon equip the prolific Type 041 Yuan-class submarines which prowl the seas today. Another theory is that leaks allowed seawater to mix with battery acid, forming deadly chlorine gas that poisoned the crew. The Hong Kong Sing Tao Daily claimed the submarine had embarked on a “dangerous” antisubmarine training, and that “human error” led it to nose-down uncontrollably, causing it to get stuck on the seafloor. However, the most widely accepted explanation today was first published by the Hong Kong Wen Wei Po, a pro-Beijing newspaper: the crew was suffocated by the sub’s diesel engine. A conventional diesel electric submarine uses an air-breathing diesel engine to charge up its batteries for underwater propulsion. This is usually done while surfaced—but a submarine attempting to remain undetected can also cruise submerged just below the surface and use a snorkel to sip air. The snorkel is designed to automatically seal up if the water level gets too high. According to Wen Wei Po, 361 was running its diesel while snorkeling when high water caused the air intake valve to close—or the valve failed to open properly due to a malfunction. However, its diesel engine did not shut down as it should have in response. You can find what appears to be a translated version of the article here. Any of these explanations would reflect serious failings in both crew training and mechanical performance. The recent tragic loss of the Argentine submarine San Juan, the fire raging amongst moored Russian Kilo-class submarines at Vladivostok (a drill, Moscow claims), and the fortunately nonfatal but highly expensive flooding of the Indian nuclear-powered submarine Arihant highlight that despite being arguably the most fearsome weapon system on the planet, submarines remain dangerous to operate even when not engaged in a war. Even brief breakdowns in crew discipline or mechanical reliability can rapidly turn the stealthy underwater marauders into watery coffins. Only high standards of maintenance, manufacturing and crew training can avert lethal peacetime disasters—standards which are difficult for many nations to afford, but which the PLA Navy likely aspires to it as it continues to expand and professionalize its forces at an extraordinary rate.